MOSCOW, Russia -- A cemetery on the outskirts of Pskov, in northwestern Russia, has become a dangerous place to visit. Russian soldier in Ukraine. For months, Russia has denied its army is fighting inside Ukraine, and those who say otherwise are branded “foreign agents” and enemies of the state. Inside are recently dug soldiers’ graves that some believe prove the Russian military’s direct involvement in the war in Ukraine. Russian journalists who tried to go the cemetery were chased away by young men in tracksuits, who appeared to have been stationed there to dissuade visitors. A local politician was beaten unconscious after he started investigating why men from the elite 76th Guards Air Assault Division, which is stationed in Pskov, were coming home dead. For months, Russia has denied its army is fighting inside Ukraine, and those who say otherwise are branded “foreign agents” and enemies of the state. But the returning corpses are a fact that even state-run television can’t completely hide. That’s forced the Kremlin to adjust its narrative – it now admits there are “volunteer” soldiers aiding the pro-Russian rebels in the Donetsk and Lugansk regions – in order to avoid losing the support of a public still traumatized by the wars in Chechnya and Afghanistan. Lev Shlosberg, a member of the Pskov regional assembly, is still recovering from being beaten at the graveyard two weeks ago. “They were well-trained professionals who knew how to beat people,” he said of his attackers, in an e-mail to The Globe and Mail written from his hospital bed. Mr. Shlosberg has no doubts why he was targeted. He had witnessed the burial of a paratrooper several days earlier – he believes the soldier was killed fighting in eastern Ukraine – and told journalists about it. The message he received was painfully clear: No one is allowed to talk about Russia’s secret war in Ukraine. “[The attack] is the revenge of those who are involved in sending troops from Pskov to Ukraine … We broke their secrecy by publicizing the soldier’s funeral,” Mr. Shlosberg, a member of the opposition Yabloko party, wrote. In August, parents distraught over the whereabouts of their sons began to contact Svetlana Melnikova, who helped found the Committee of Soldiers’ Mothers during the Soviet Union’s war in Afghanistan – where the Kremlin also initially sought to play down its role. The group took on eight cases, and Ms. Melnikova says the group was eventually able to reach two of the missing soldiers. Both sent text messages saying they were serving in eastern Ukraine. “It looks like a war, people are being shot just like in a war, people are dying just like in a war,” Ms. Melnikova said in an interview last week in her group’s cramped office in central Moscow. She had just finished meeting with U.S. diplomats who also wanted to know what she was hearing. She admitted she had no hard evidence to prove her assertion that up to 15,000 Russian soldiers have served in eastern Ukraine this summer. Some of those troops have reportedly been withdrawn since Putin and Ukrainian President Petro Poroshenko arranged a Sept. 5 ceasefire, which appeared in jeopardy Sunday after fresh fighting was reported in the city of Donetsk. NATO officials say more than 1,000 Russian soldiers remain on Ukrainian territory, aiding the rebels. “This invasion of Ukraine is a secret operation. There’s nothing on TV, journalists say nothing about it. Nobody can say that we are there,” Ms. Melnikova said with a sigh. The Kremlin’s line has shifted several times over the course of the crisis in Ukraine. 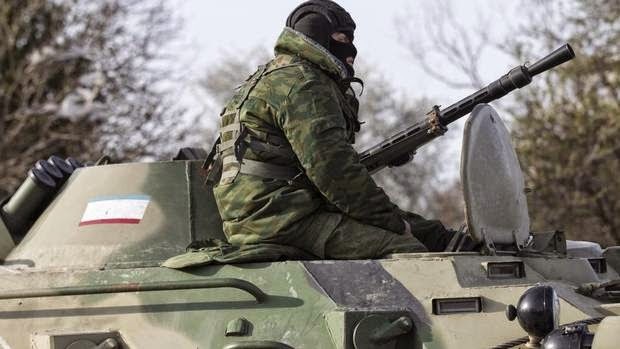 In March, Moscow denied there were Russian soldiers in Crimea even as well-trained troops, wearing no insignia but backed by columns of armoured personnel carriers, took control of the peninsula. A month later – after Crimea had been annexed by Russia – Putin proudly admitted the “little green men” had indeed been Russian soldiers, deployed to ensure order ahead of the controversial referendum on joining Russia. In the same April speech, Putin referred for the first time to eastern Ukraine as “Novorossiya,” or “New Russia,” a Czarist-era term that was interpreted as a green light to the increasingly bold separatist movements that had taken over government buildings in the Donetsk and Lugansk regions. Even earlier, there were reasons to believe at least some Russian troops were in eastern Ukraine. One day before Putin gave his provocative address in Moscow, pro-Russian fighters had scored one of their first victories in the battle for the Donetsk region, seizing a small column of Ukrainian armoured personnel carriers. Some of the rebels in the city of Slavyansk that day did appear to be the rag-tag militia they claimed to be, wearing mismatching uniforms and running shoes. Others had a professional look and attitude that recalled the so-called “little green men” of Crimea. Under his green camouflage, open at the neck, he wore a striped blue and white telnyashka T-shirt that resembled those worn by Russia’s paratrooper and special-forces units. His black boots were shined. He cradled his assault rifle like a veteran. But, beyond such observations by journalists and others, little was provable about Russia’s involvement in Ukraine. There were occasional videos of Russian military equipment moving around the region – most famously in the case of the Buk anti-aircraft missile system blamed for shooting down Malaysia Airlines Flight 17 – but Moscow always claimed the rebels could have obtained their arsenal from the Soviet-era stores of the Ukrainian army. In fact, the leaders of the Donetsk and Lugansk “people’s republics” bitterly complained – after being driven out of Slavyansk and other cities this summer – of how little help they were getting from Moscow against an increasingly effective Ukrainian army. As recently as a few weeks ago, the rebels seemed on the verge of defeat. In late August, reports of Russian involvement took a more concrete form. On Aug. 14, two British journalists in south Russia witnessed what they said was a column of Russian armoured vehicles entering eastern Ukraine. A series of rapid battlefield reversals followed, with pro-Russian forces opening a new front along the Sea of Azov coast and relieving the pressure on surrounded Donetsk and Lugansk. The evidence left behind by the retreating Ukrainian army – columns of shattered tanks and armoured vehicles that looked to have been destroyed either from the air or by high-precision artillery – suggested that this new offensive had direct support from Russia’s military. NATO said it believed that several thousand Russian troops had helped in the thrust along the Sea of Azov coast. While the Kremlin dismissed NATO’s accusations – which were based on satellite photographs – as fantasy, there were other grimmer signs that Russian troops were now fighting and dying in Ukraine. The St. Petersburg branch of the Soldiers’ Mothers was designated in August as a “foreign agent” after chairwoman Ella Polyakova told the independent news site Dozhd that 100 injured soldiers had arrived in St. Petersburg hospitals after being wounded in an undisclosed location, which she suggested was likely eastern Ukraine. Photos of the Pskov burials, and of a refrigerator truck photographed crossing from Ukraine into Russia with the marking “+ 200 +” – an apparent reference to “Cargo 200”, the Soviet-era code word for corpses – have been also widely shared online in recent weeks, raising the first questions inside Russia about the military’s role in Donetsk and Lugansk. Opinion polls show most Russians believe what state-controlled media is telling them about the conflict in eastern Ukraine – the rebels in eastern Ukraine are portrayed on TV here as fighting to defend the Russian language and culture against an ultranationalist government in Kiev. But that could rapidly change if body bags started coming home in larger numbers. “People support the separatists in [the Donetsk and Lugansk regions], but they don’t precisely know what’s happening there,” said Lev Gudkov, director of the Levada-Centre, Russia’s lone independent pollster. Mr. Gudkov said Putin’s approval ratings remain well over 80 per cent, undented so far by the mounting Western sanctions against Russia. The United States and European Union both rolled out new measures on Friday targeting the giants of Russia’s energy, finance and defence industries. But support for the government’s policies in Ukraine, Mr. Gudkov said, has started to fall fast, from more than 70 per cent in the spring to closer to 40 per cent today. The Kremlin appears to have realized that public backlash could quickly mount if it stuck to denying the war even as Russian soldiers were being killed in Ukraine. So it changed the narrative again. State media now acknowledge that there are Russians fighting in Ukraine. But they are described as volunteers – and heroes. “The major failure of the state was not – strangely – that [the soldiers] were killed in a war that we’re officially not fighting, but that they’re trying to hide [their deaths], That’s bad. That’s perceived as indecent,” said Fyodor Lukyanov, editor of the foreign-policy journal Russia in Global Affairs. It’s a version that infuriates Ms. Melnikova. She says the Soldiers’ Mothers are certain the Russian troops fighting in eastern Ukraine were sent there by their commanding officers. “A few weeks ago, soldiers started getting new contracts saying they’d been sent to Luhansk. If they didn’t sign, someone signed for them,” she said. Quote: «Предвыборные программы партий - как секретные документы генштаба. Увидеть и подержать в руках совершенно невозможно. В отличие от мировой практики, где избиратели, эксперты и общественные деятели имеют свободный доступ к партийным программам и принимают участие в их обсуждении, в Украине информацию буквально по крупицам собирать приходится», - отметил Карасев в своем комментарии изданию UAinfo. It would be important for the democratization process in Ukraine to make it mandatory for all parties to disclose its party's programs. Public finally must understand who their are voting for.